Oh, to be young again. I could sit on the couch for a month and then go out and hike for 15 miles. Sometimes I was sore the next day but I felt normal again 2-3 days later. Then age happened. And a back injury. And my knees started to grind terribly. My mind still thought I could hike 15 miles in a day after weeks of not doing much. My body had a different take on that. Instead of hurting for a couple of days afterward, it took longer to recover. Sometimes I would injure myself and have to take a couple of weeks off from my favorite pastime. Gretel was young and injury-free once too. She also had no problem sitting around on the couch all week (or two… who are we kidding) and going for a 20-mile overnight hike on the weekend. Together, we made an awesome weekend warrior team. But Gretel is no longer a spring chicken either. And she also has a bad back. If I take longer to recover now, I’m sure she does too. Luckily she hasn’t re-injured her back but I know it could be just a matter of time. All of those years of weekend warrioring took a toll on my body and I’m sure it did Gretel’s too. If we had properly conditioned ourselves for hiking back then, we might not have the injuries that we do today. Now we can’t be lazy – we must be in the right physical condition if we hope to hike for many years to come. Note: some of the links below are affiliate links. This means when you click on a link and make a purchase, I will receive a few pennies to help maintain this website. About this time last year, Gretel hurt her back and was diagnosed with Intervertebral Disk Disease (IVDD). Her back injury was not bad enough to warrant surgery, and she was never paralyzed like some dogs with IVDD are, but she did need several months of rehab to recover. As it turns out, much of her “recovery” exercises are good for increasing stamina, strength, balance, and flexibility for all dogs before or during high activity periods. The exercises are especially important for athletic dogs that hike, do agility, or participate in other sports. Based on my past experience, this is the training plan I’m implementing for Gretel. Note: I’m not a veterinarian. I have worked closely with a rehab vet though and understand that these exercises are universally helpful. However, you should always check with your vet first before starting your dog on a new exercise routine. Also, you may want to do more research, or go see a doggy physical trainer, to make sure your dog is doing the exercises properly. Doing them improperly can lead to injury or, at the very least, will render them ineffective. Walking regularly is one of the biggest keys to a dog getting fit and staying fit. Walking can help them maintain a healthy weight, which puts less strain on their joints and heart. It also uses almost every muscle in their body and improves their cardiovascular fitness. Ideally, the walks would start out shorter and flatter and build to longer hikes that incorporate hills. If I had plenty of time, Gretel and I would walk 1-3 miles, 7 days a week. Unfortunately, my time is limited. The minimum we should walk in order to build fitness is 3 days a week. I’m going to aim for 3-4 days a week with at least one of the walks being 3 miles. When Gretel was recovering from her back injury, we were given a whole bunch of exercises to do (click the link to see them all). All of them were valuable but I noticed that some helped her more than others. Also, some were more time-consuming than others. Although I want to do the best to get her into hiking shape, I have to balance that with my available time. Also, since we’ll be traveling a lot this spring, the exercises need to be pretty easy to do in a hotel room or at a campground. Below are the exercises that yielded the best time to benefit ratio and that I plan to start doing again to get her ready for hiking season. They require either a K9 FITbone and/or a balance ball made for dogs. Balance ball stand (aka. all 4 unstable) – This exercise strengthens the core. It’s done on a K9 FITbone or balance ball. It’s important to keep your dog’s topline (back) straight and neutral while your dog is fully standing, not squatting or resting on their hocks (trying to crouch or sit). For this exercise, it’s about standing properly and balancing on an unstable surface. Paws up to rear paw target – This exercise strengthens the core, rear, and chest muscles. The idea of this exercise is to encourage a weight shift to the front from the back legs while standing on an unstable surface. Standing with their front paws on the FITbone and their back feet on the ground, your dog’s head should be held up and their back should be straight. Have them hold this position for 10 – 15 seconds. Then have your dog walk over the FITbone so their front paws are on ground and only their back feet are on the unstable surface. Have them hold that for 10 – 15 seconds too. Then either have them step down, walk around the bone, and start over. To make the exercise more difficult, ask your dog to back up and put both of their front and back feet on the bone, and then back up some more to step their back feet off. Walk backwards – This exercise teaches body and hind leg awareness. A helpful way to start is to create a chute with an X-pen or pillows and entice your dog into it with a treat. Ask your dog to walk in and then back out in one fluid movement (don’t pause at the end – this is key). Ideally, they will step backwards instead of crouching and scooting backwards. If your dog is wary of the chute, you can start with leading them in just a little and then increasing the depth. Once your dog understands what they are being asked to do, you can progress to asking them to back up with no walls on either side. (this video shows Gretel practicing it in a wire “chute” but now that she knows what I’m asking of her she can do it without it). Cavaletti rails – If you are not familiar with Cavaletti rails, they are like several small horse jumps in a row. The goal is to get your dog to step over them one leg at a time – first front, second front, first back, second back – without hopping or jumping. It teaches them body awareness and to pay attention to what their feet are doing. Also, it teaches them to pick up/bend their back legs instead of walking stiff-legged (like Gretel used to do). It might be a good idea to start with 4-6 rails laid on the ground – placed as far apart as the dog is tall at the shoulders – and then progress to poles that are elevated about 1-2 inches off of the ground, depending on your dog’s height. You can buy a set of these cavaletti rails for dogs (or hurdle set as they are sometimes called) or check out this awesome tutorial to make your own for under $15. Salmon Oil – Fish oil is a great source of the omega-3 fatty acids EPA and DHA, which reduce inflammation, assist in cardiovascular fitness, and provide other benefits to the body. My favorites are Grizzly Salmon Oil™ and Life Line Wild Alaskan Salmon Oil. Both are 100% real salmon oil from wild Alaskan Salmon to ensure the source fish are free of harmful toxins and disease. Turmeric (Curcumin) Golden Paste – There are a whole slew of good things this ground root can do for your dog but the two biggest are reducing inflammation and pain associated with aging and damaged joints. Turmeric has been found to be more effective if it’s turned into a “golden paste” first. This is the recipe for golden turmeric paste I use (I don’t like to cook but this is super simple to make). VetriScience® Vetri Disk – This supplement supports spinal health. It combines bovine tracheal cartilage with amino acids, mineral sulfates, vitamins, pepsin, and natural silicon sources to help support and maintain connective and disk tissue. Joint Supplement – The brand of supplement we use varies. There are several high-quality joint products that I trust and I think that rotating them, along with any others that sound promising, gives the most benefit (because each one contains a little something different or varying amounts of the best stuff). Our go-to joint supplements are Glycoflex Plus, ActivPhy Joint and Phycox Canine Joint Support. Hemp CBD (Cannabidiol) Oil – CBD oil is derived from industrial hemp and contains no THC, the compound that produces a “high”, so it’s safe for dogs. Benefits of CBD include reducing inflammation, reducing pain, and increasing muscle repair after strenuous exercise. There are many other benefits that include potentially fighting cancer. I’ve tried most of the CBD products for dogs on the market with Chester and Gretel and the one I think works best is from Pet Releaf. 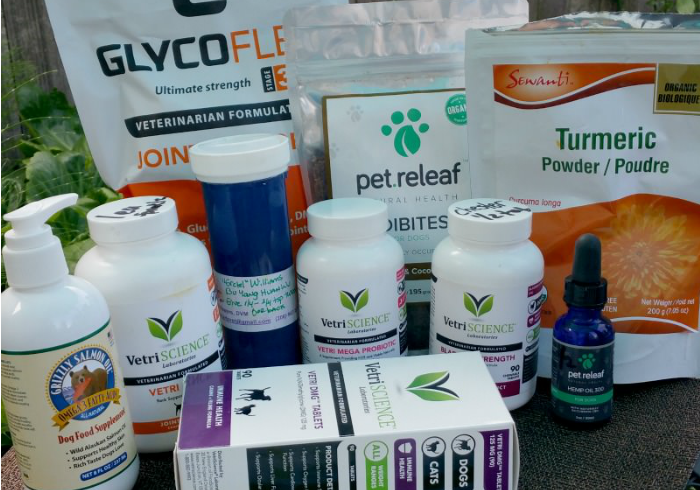 Related: Can Hemp CBD Oil and Treats Benefit Your Dog? You can see the whole (long) list of supplements that Chester and Gretel take HERE. How Long Will It Take to Condition Your Dog? How long it will take your dog to get into shape for the hiking season varies. Each dog is different and there are a lot of things that factor into it. For example, age, whether they are carrying extra weight or not, how in shape they are before starting this conditioning training, and how long it’s been since their last period of sustained exercise all factor into the equation. The important thing is to start slow and increase the effort and duration as time goes on. Keen an eye out for signs that they have been pushed too far like soreness, limping, and repetitively licking the same area (this can signal pain) and back off for a few days if you need to. You can help them recover from exercise sessions by massaging their muscles. Based on my past experience, both with Gretel and my own marathon training, I would say the average minimum time is 6-8 weeks. Your Turn. 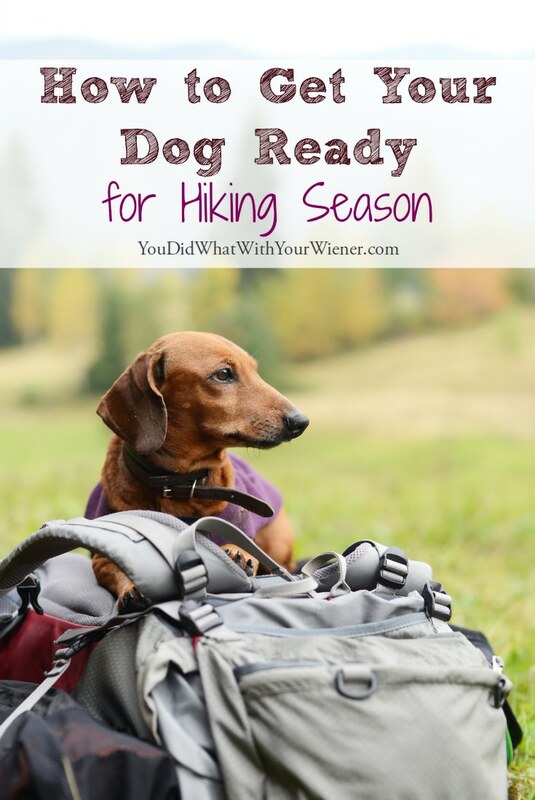 How do you get your dog ready for hiking season or ensure they stay physically fit? I spend a lot of time making sure my dogs remain in good condition. It is one thing for me to do the weekend warrior thing at a flyball tournament, it is a whole different deal for my dogs. Of course our walks get me some conditioning as well, but we do a lot of off leash hiking, which means my dogs do a lot more than I do while out. Committing to regular walks with Gretel will definitely help me too. I had some info in this post about my own fitness conditioning alongside hers but I took it out. It’s super long as it is! Ha, ha. This was really helpful! We’re moving this summer to a place that will have actual mountains (yay!) so I’ve been browsing your blog more and more. Luckily I already do most of these things with Nola, but I’ll have to try the rails. She’s 6 now, but since we’ve always done a lot of conditioning, she still acts three years old. I’ve just recently started giving gold paste and Nola loves the flavor. I don’t know what I would do without my mountains. I visited Florida in February. It was a nice, relaxing, sunny vacation but I missed home. I forget where you said you were moving? I’m a tad surprised Nola likes the taste of the golden paste. I have to mix in in Chester and Gretel’s food really good for them to eat it. If I accidentally leave a chunk on the side of the bowl, they leave it there too 🙂 And those dogs will eat about anything! My boy has back issues also and had surgery about a year and a half ago. Once his back was operated on and he recovered, I started him on 1-TDC (recommended by a fellow doxie lover). He has been on the supplement for over a year and he runs around and hikes with me daily, 5+ miles a day. I know that it is not a 20 mile hike on a weekend but it keeps him fit and trim and also I get the benefit of staying fit, no so trim though…LOL. Anyway, you might want to research the product: . All the best to you and Gretel and Chester!!! Love your blog!!! Hi Jessica! Thanks for sharing tips, advises and recommendation for making our fur babies ready for hiking! I love that you’ve included Hemp CBD (Cannabidiol) Oil for supplements. We usually prep our fur baby for hiking by making sure he wouldn’t miss our everyday walks.